Just finished a home or office renovation? Your contractor should make arrangements with you for how to remove large objects like drywall, countertops, old furniture, and others, as you will not be able to lift those heavy objects yourself. But even with the big stuff out of the way, there’s still lots of work to do to clean up the remaining debris. In small amount dust is manageable because it’s easier to clean when it’s not clumped together, and it’s okay to leave to leave a small bit behind because it won’t be too noticeable. Renovation leaves behind a lot of dust, so you’re going to need to clean using different strategies—also, expect to go over each surface more than once to get the job done. Use a broom, feather duster, and dry rags to remove as must dust as possible first—because once you’ve exposed dust to water it starts to stick to the closest surface, and it is much harder to remove once dried. A wide-angle broom with straight bristles works best for sweeping; soft rags will pick up dirt and dust more than other types. A shop vac is like a regular vacuum except it can vacuum large debris and water, even if it doesn’t offer stronger suction than the average vacuum used at home. When cleaning with a shop vac, start by leaving a bit of water inside the canister so that when you vacuum dry debris, it will form a slurry instead of being ejected into the air, which reduces air quality and adds to the mess you’re trying to clean. If you prefer to use your own vacuum, make sure that there are no air leaks inside, because if there are some of the dust will shoot right back into the room. Replace the filter if it’s dirty, and have spares on hand in case you need to change them in the middle of cleaning. 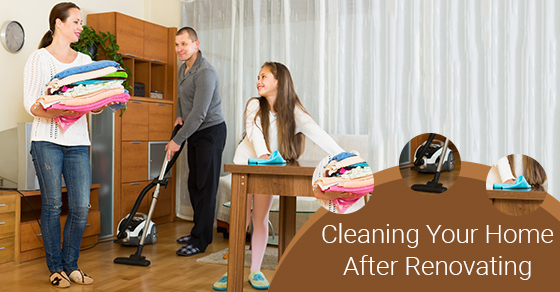 Cleaning after a renovation requires a lot of work, but a good vacuum and an extra set of hands will make the job move faster.